I recently paid a visit to one of the prettiest mountains in northern Hamilton County. It’s probably not one that you’ve heard about, because it has no trail. But the summit of this small gem features an extensive amount of open rock with photogenic views south along Long Lake. 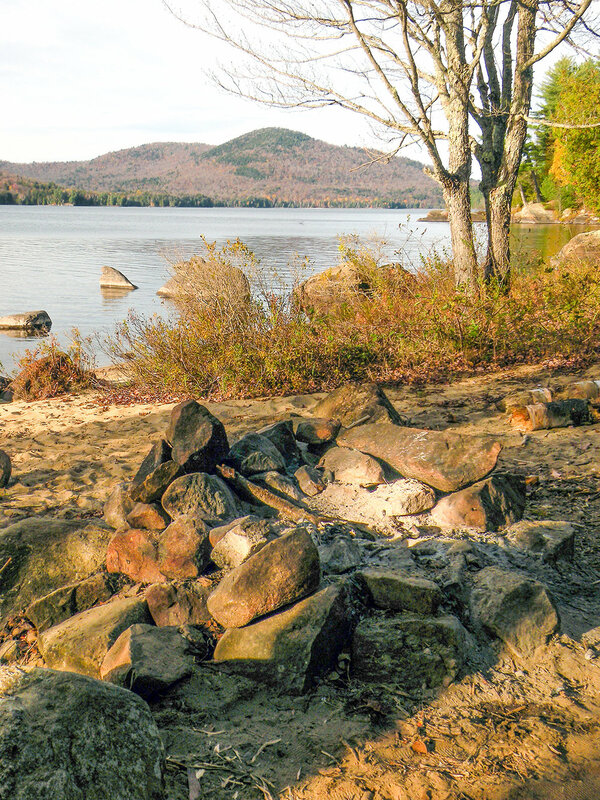 Getting there involves a scenic hike along the shores of Long Lake, with several enticing camping options. The name of this mountain is Blueberry, and while I was there well after the berry-picking season, I would not be surprised if it lived up to its name in late summer. It might not have always been so obscure, because it abuts Kempshall Mountain, a former fire tower summit, but it has probably never been well known. Bushwhacks have a way of dimming the popularity of even the most beautiful mountain vistas. That is for the best; if you make the effort to seek out Blueberry Mountain, the probability is high that you will have it to yourself. I do have one note for photographers, though: try to get here in the morning. The thrust of this view is southwestward, meaning you will be facing into the sun after the noon hour. I recommend carrying an overnight pack and partaking in one of the excellent backcountry camping options in and around Kelly Point. That way you can start directly up the mountain after breakfast. From the intersection of NY Routes 28N and 30 in Long Lake, follow Route 28N east up the hill and out of town. At 1.5 miles you reach the junction with Tarbell Hill Road. Turn left and follow Tarbell Hill Road for 0.7-mile to the trailhead, marked by a small sign on the right. This outing begins with a hike of 4.3 miles along the Northville-Placid Trail, or NPT for short. Beginning on the east side of the road, the trail descends a bit but then rolls through the woods to a stream crossing at 0.6-mile, and then a larger wetland crossing at one-mile. Problems with maintaining a bridge through this wetland prompted the creation of a detour in recent years. The NPT now veers left, heading downstream to a rock-hop stream crossing. The crossing brings you to the Catlin Bay Lean-To. Since it is just 1.1 miles from the road, there is almost always activity here. For tent campers, there are alternate sites nearer the water where the old lean-to used to stand. This is your first sighting of Long Lake, which you will remain close to for several miles. A side trail leads left to the Hidden Cove Lean-To at 1.7 miles, and at 3.9 miles you reach the Kelly Point Lean-Tos. These shelters stand side by side and are immensely popular. If hikers haven’t claimed them, then boaters certainly will be there, especially in the summer. At 4.3 miles, you reach what used to be a four-way trail junction, still evident despite the absence of signs. The way right once led to Kempshall Mountain. Left leads to a pair of attractive designated tent sites (one on each side of the stream) with their own shared sand beach. Although the fire tower on Kempshall Mountain was removed decades ago – and with it, the motivation to climb that wooded summit – the abandoned trail is in remarkably good shape. It makes an obvious approach route to Blueberry. This trail leads southeast away from the lake, following the south bank of a small, unnamed stream. You may even see a few of the old metal trail markers that were in vogue half a century ago. Stay on the trail for about 0.8-mile, to the point where it crosses the stream you have been paralleling at roughly 2,100 feet in elevation. Here the old trail begins to curve northeastward on its ascent of Kempshall Mountain, ceasing to be useful as a way to reach Blueberry. Instead, strike off through the woods on a southwesterly heading. The woods are blissfully open, a joy for bushwhacking. In short order, it should be obvious from simple terrain observation that you are on the mountain. Rather than climbing directly up the shortest route to the summit, adjust your course so that you are angling up the mountain’s northern slopes. This is because the open hardwoods on this part of the mountain are so much more pleasant than the thick conifers elsewhere. If your navigation is spot-on, you will approach the 2,612-foot true summit from the north. There are patches of open rock here, but the one you want is located a short distance to the southwest. It begins as a narrow lane of rock and lichen, but as you follow it downslope it widens into an impressive apron of open rock, several acres in size. The southern half of Long Lake and its mountainous environs are the centerpiece of this vista. Blue Mountain, which you might expect to be included, remains concealed by the long Fishing Brook Range.